The Pilot Syndicate was originally founded by Hirai Kaz in November 3299. Having been repressed for a number of years, and moved on from one Alliance to the next, the Pilot Syndicate has risen again! 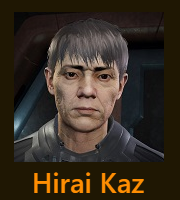 Hirai Kaz has since been pardoned by the Empire. Following 8 months of searching followed by months of negotiations, Pilot Syndicate 4 announced that HIP 19934 as its new home system.